Our evolving understanding of the immunology of the hepatitis B virus (HBV) has led to the development of safe and effective therapies for preexposure and postexposure virus-specific prophylaxis. Perinatal transmission of HBV from mothers with chronic infection to their at-risk neonates remains a significant route for the perpetuation of the HBV carrier state, with its concomitant health risks, worldwide. This section outlines the evidence supporting antenatal identification of HBV-carrier mothers and targeted HBV immunoprophylaxis in their newborn children. Widespread adoption of such approaches, combined with ongoing HBV vaccination protocols in high-risk populations, including medical personnel, will make significant inroads against the overall prevalence of HBV-related disease. Although an exhaustive discussion of HBV biology is beyond the scope of this chapter, an understanding of the basic structures and serologic tests associated with the virus is essential to understanding the logistics of perinatal transmission and prevention. HBV is a small (42-nm) DNA virus that contains partially double-stranded DNA within its core.1 Using its own DNA polymerase for replication, the virus is able to reproduce within a host's infected hepatocytes, drawing from the cell's pool of nucleotide precursors. Much attention has been paid to the use of HBV-specific markers in serum to distinguish active from previous infection and to determine the relative infectiousness of a particular individual. Not surprisingly, these concerns are directly applicable to determining relative risks for vertical (maternal–fetal) transmission of the virus. Hepatitis B surface antigen (HBsAg) is the HBV serum marker that has come to be used most commonly in clinical situations and screening protocols. Discovered by Blumberg and co-workers in 1965,2 it initially was not known to be a virus-associated marker. The antigen, first isolated in the serum of an Australian aborigine during a study of serum protein polymorphisms (hence its being labeled the “Australia antigen”),3 was found incidentally to cross-react with the serum of multiply transfused patients. Later found to be present in the serum of institutionalized patients, it was even believed to be possibly associated with Down syndrome.4 Subsequent work by Blumberg's group and others established a link between the newly identified antigen and acute hepatitis B, an association confirmed by electron microscopy identification of particles dense with the antigen in the serum of patients who were acutely ill with hepatitis.5 Those particles now are known to represent incomplete portions of the viral envelope, synthesized in great excess during the process of virus replication. In addition, intact viral particles bear the surface antigen on their outer envelope. The presence of HBsAg in serum indicates infectivity, although such presence alone cannot distinguish acute from chronic infection, an often confusing exercise that requires a more complete elaboration of HBV-related serologies. Although HBsAg is the first antigen detectable in the course of HBV infections, predating even the appearance of symptoms in those patients who become clinically ill, it is the predictable appearance and disappearance of other HBV-associated antigens and antibodies over time that allows patterns compatible with either acute or chronic infection to be described. Currently, six distinct antigens and antibodies are assayable in clinical specimens through the use of commercially available test kits and machinery. The agar gel precipitation techniques first used by Blumberg's group to demonstrate HBsAg antigen–antibody complex formation has given way to fully automated, multisample readers that capitalize on advances in molecular biology to detect the presence or absence of the specific immunogens in question. 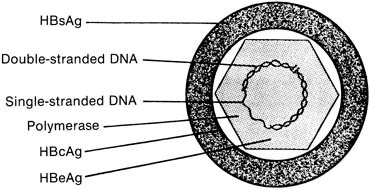 The complete hepatitis B viral particle, also known as the Dane particle, after Dane and co-workers who described it in 1970,6 consists of the viral core surrounded by its HBsAg-rich envelope (Fig. 1). If the envelope is removed by the use of detergents in vitro, a viral core antigen (HBcAg) can be identified. Unlike HBsAg, HBcAg does not circulate free in serum and is found in blood only as an integral component of the internal viral nucleocapsid. A third antigen, the e antigen (HBeAg), is serologically distinct from both HBsAg and HBcAg. HBeAg is associated primarily with the core antigen in the virus's internal structure, but unlike HBcAg, it can be found circulating in serum, frequently in complexes with immunoglobulin.7 All three serologically unique antigens stimulate the production of equally distinct antibodies (HBsAb, HBcAb, and HBeAb) in the course of nonchronic host infection. Hepatitis B is distinguished from the other viral hepatitides by its long incubation period (1–6 months), by the presence of extrahepatic symptoms in up to 20% of patients (arthralgia, rash, and myalgia thought to be a result of antigen–antibody complex deposition),52, 53 and, eventually, by the detection of HBV-specific serum markers (Fig. 2). The appearance of HBsAg usually predates any clinical symptoms by 4 weeks, on average, and remains detectable for 1 to 6 weeks in most patients.54 In the 90% to 95% of patients in whom chronic infection does not develop, HBsAg titers decrease as symptoms diminish. The appearance of HBsAb defines the absence of the carrier state; titers increase slowly during the clinical recovery period and may continue to increase up to 10 to 12 months after HBsAg is no longer detectable. In most patients with self-limited, acute hepatitis B, HBsAb is detectable only after HBsAg titers in serum disappear.55, 56 A “window” of time has been described in which a patient still with clinical hepatitis is negative for both HBsAg and HBsAb. During this time, HBV infection still can be diagnosed by the detection of HBcAb, which begins to appear 3 to 5 weeks after HBsAg does. 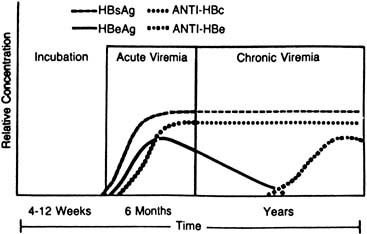 HBcAb titers may decrease in the first 1 to 2 years after infection, although the antibody is still detectable years after acute disease in most patients.55 The appearance of HBeAg parallels that of HBsAg; in self-limited infections, HBeAb is detectable soon after the time that HBeAg disappears. Acute HBV infection during pregnancy is treated mainly by supportive measures, as in the nonpregnant state. An increase in fulminance and mortality rates with acute HBV infection during pregnancy has been demonstrated in some HBV-endemic areas,62, 63 although other investigators in Western countries have suggested that these adverse outcomes were related more to health care conditions and maternal malnutrition.64, 65 No teratogenic association has been established for maternal HBV infections,64, 66 even though evidence of HBV infection at birth in children of HBV-carrier women have suggested the possibility of transplacental leakage of HBV-infected blood from mother to fetus in utero.67, 68, 69 Encouragement is necessary to maintain adequate nutrition during the early symptomatic phase, and liver-metabolized drugs, if not avoidable, need to be monitored carefully through blood levels. Phenothiazine may be used, if needed, to control nausea and vomiting. In addition, household and sexual contacts of patients should be offered passive immunization with HBIG after their HBsAg seronegativity is established. Universal screening protocols for prenatal patients have been advocated by a number of groups and are discussed more fully in the next section. Routine screening with HBsAg testing detects both chronic carriers and asymptomatic, acutely infected patients. A positive HBsAg result in early pregnancy should be followed-up by tests for liver function, as well as HBeAg and HBeAb; HBcAb is not helpful in distinguishing acute from chronic disease, and HBsAb rarely is present if HBsAg is still circulating. Repeating the tests for HBsAg and liver function later in pregnancy, however, does help to make the diagnosis and guide the need for perinatal prophylaxis of the neonate. Although a recent multicenter study indicated that treatment of chronic HBV carriers with alfa-interferon was effective in achieving remission, both biochemically and histologically, in one third of patients,70 such therapy cannot be recommended in pregnant HBV carriers. No information currently exists to guide the use of genetic prenatal diagnostic procedures in HBsAg-positive women and the potential risk of producing in utero infection, although studies have demonstrated that such infection is possible in the face of preterm labor or placental abruption.67, 68, 69 HBIG, administered periprocedurally to HBsAg-positive women, may protect the fetus from infection in a manner comparable with the use of Rh-immune globulin in Rh-negative women, but again, such statements are purely speculative and await further investigation before they take the shape of recommendations. Discussion of perinatal HBV infection focuses on the following three major areas: (1) the transmissibility of the virus from mother to fetus; (2) the sequelae of neonatal infection; and (3) the effectiveness of currently available modalities for prophylaxis. Finally, the extensive variance in prevalence rates worldwide requires that the feasibility of prenatal screening programs to identify carrier mothers be addressed. The potential for vertical transmission of HBV at birth is significant. Most infants born to carrier mothers are HBsAg-negative at birth experience seroconversion in the first 3 months after delivery, suggesting acquisition of the virus at birth.71, 72, 73, 74 Mothers positive for both HBsAg and HBeAg are at highest risk for transmitting the virus; 85% to 100% of their offspring become infected, with 70% to 90% becoming chronic carriers. Mothers who are HBsAg-positive but HBeAg-negative, presumably indicating lower levels of replicating virus, do have a lower risk of transmitting the virus, but up to 35% of their children still will become carriers in the absence of neonatal therapy.75, 76, 77, 78 In addition to the long-term risks of HBV-related sequelae in chronic carriers, such as cirrhosis and hepatocellular carcinoma, both fulminant fetal neonatal hepatitis79, 80, 81 and childhood-onset hepatic carcinoma,82 have been described in children born to HBsAg-positive mothers. The efficacy of perinatal HBV vaccination programs in preventing infection in children born to carrier mothers has led to the inclusion of the HBV vaccine series in the American Academy of Pediatrics' current recommendations for childhood vaccines for the general population.115 Still, investigators have demonstrated that even in high-risk groups for perinatal HBV transmission, appropriate neonatal surveillance is critical. Among 426 children born to HBsAG-positive mothers in one longitudinal series, only 68% were completely vaccinated with the full three-dose sequence. Among the children followed-up, it was shown that the third vaccine dose was least likely to be received (64%). Serologic evaluation of the children in this well-conceived surveillance program showed 4% to have acquired chronic carrier status, with an additional 10% having evidence of resolved natural infection, as demonstrated by positive tests for antiHBc. Not surprisingly, incompletely vaccinated children were more likely to be HBsAg-positive than those completing the series (12% vs 1%; relative risk 7.9 [confidence interval = 1.5–41.2]).116 These findings underscore the need for reinforcement of complete vaccination for all children enrolled in the HBV vaccine series, particularly those born to carrier or other high-risk mothers. The beneficial impact of adequate childhood vaccination for HBV recently has been demonstrated dramatically in reports from Taiwan, where large-scale mass vaccination programs were begun in 1984. Researchers there have conclusively proven a link between HBV and hepatocellular carcinoma (HCC) by showing a significant decrease in the average annual incidence of childhood HCC since the institution of the program.117, 118 The decrease in the rate of childhood HCC was also paralleled by a decrease in the rate of HBsAg carriage among children born before the vaccination program was started, suggesting a herd immunity effect from the mass inoculation of children in the much more infectious younger birth cohorts, and resulting in a lower rate of horizontal HBV infection among the older unvaccinated children.117 These researchers had demonstrated previously that 5 years into the institution of the vaccination program in Taipei, the HBsAg carrier rate in children younger than age 5 years had decreased from 9.3% in 1984 to 2% in 1989.119 These results even further bolster the need to identify HBsAg carrier mothers and provide timely and complete HBV vaccination to their children. While antiHCV testing includes initial screening with an immunoassay, the false-positive rate of approximately 1%, especially for a low-risk patient, raises the possibility of an improper diagnosis being given without appropriate confirmatory testing. In contrast to serologic diagnosis of HBV, in which certified laboratories are required to perform supplemental confirmatory testing before issuing a positive HbsAg test result, no such automatic “reflex” testing has been mandated for HCV antibody screening. In a patient at high risk for HCV infection with a positive antiHCV test result, the chance of a false-positive ELISA is exceedingly low. However, recognizing that most laboratories report positive antiHCV results using screening assays alone126 despite previous recommendations,127 the CDC expanded its HCV testing algorithm to include an option for supplemental testing based on “signal-to-cutoff” (s/co) ratios of positive assay results.126 Because pregnant women do not constitute a high-risk group requiring HCV screening by CDC guidelines unless other risk factors exist (Table 4), both the importance of understanding the limitations of even the most currently available screening assays and the ability to interpret test results for patients are critical for clinicians who might be ordering HCV screening tests. Sexual transmission of HCV has been implicated variably. A report before the availability of specific HCV tests suggested that up to 11% of NANBH cases, in the absence of other identifiable risk factors, could be related to heterosexual activity, particularly multiple sexual partners.161 Subsequently, reports using antiHCV assays have shown lower rates of HCV transmission from seropositive partners, approximately 0% to 4%.144,162 Sexual promiscuity was identified as an independent risk factor for HCV seropositivity in one recent study,163 however, and an interaction increasing the risk of concomitant transmission of HCV and HIV has been described. In these reports, men with evidence of infection with both HCV and HIV were five-times more likely to transmit both viruses to a female partner than would have been expected by chance.164,165 This potential interaction of HIV and HCV to increase transmissibility of either or both agents also has become important in describing issues surrounding maternal–fetal HCV transmission. Acute HCV infection occurs after an incubation period of 30 to 60 days. Asymptomatic infection occurs in 75% of patients; the remaining 25% present with the typical manifestations of other viral hepatitides. Fulminant hepatitis and hepatic failure attributable to HCV, as compared with that from other viral hepatitis agents, are uncommon. More recent studies from Asia and Europe have established what appears to be a correlation between maternal viral titer of HCV near delivery and the risk of neonatal infection. These studies have used newer technologies to determine quantitative, rather than qualitative, PCR results. One team in Japan showed significantly higher (2 logs) HCV–RNA titers in transmitting mothers than in those whose infants remained uninfected (106 vs 104 HCV-RNA copies/mL).189 Using similar techniques, another group in China drew similar conclusions, also demonstrating that perinatal transmission occurred only in those women whose serum was HCV–RNA positive.190 A group from the United States, however, failed to establish a similar viral burden correlation in their series, suggesting a possible role for geographic variability in genotype and virulence in explaining the variance in results.188 More recent reports have continued to confirm clearly that maternal viremia (usually defined as HCV–RNA detected in maternal blood) is a key determinant for vertical HCV transmission, regardless of maternal HIV status. Still, the independent impact of quantitative maternal viremia (“viral load”) on vertical transmission remains less uniformly established across the studies than the presence of viremia at all,191,192,193,194,195,196,197,198,199 in direct contrast to previous experience with vertical HIV transmission. The interaction between maternal and fetal humoral and immunologic is thought to be a critical contributor to both the occurrence and persistence of perinatally acquired neonatal HCV infection. The fact that maternal and/or neonatal coinfection with HIV increases the risk of vertical HCV infection suggests that HIV-infected infants, who are known to have early deficits in cell-mediated and humoral immunity, may be less able to clear small amounts of perinatally presented HCV than HIV-uninfected infants.206,207 Although no large-scale longitudinal follow-up studies exist into the natural history of perinatal HCV infection through childhood, at least one published case report has documented clearance of neonatally documented HCV–RNA by age 24 months in a child born to an HIV-negative, HCV–RNA-positive mother.208 Therefore, an intact neonatal immune system may allow for HCV clearance in early infancy as can occur in HIV-uninfected adults. More recently, Italian investigators have presented provocative data demonstrating that HCV infection of maternal peripheral blood mononuclear cells (PBMNC) was a stronger independent predictor of vertical HCV transmission than either quantitative HCV–RNA titer or viral genotype in a cohort of HIV-uninfected women.209 These researchers had previously shown the presence of an HCV–RNA strand in infected PBMNC to be a marker of active viral replication rather than one of uptake of cellular debris, as had been alternatively proposed,210 and its association with perinatal infection further emphasizes the complex interplay between maternal and fetal factors in determining the risk of neonatal HCV infection. The experience with antiretroviral treatment in decreasing both maternal viral load and the risk of neonatal HIV infections218,219,220,221 raises the question of potential comparable treatment options in the context of maternal HCV infection. Recent advances in combination therapy of HCV infection in nonpregnant adults have made sustained normalization of transaminase levels and clearance of HCV–RNA a reality, even in individuals with the less favorable HCV genotype 1.136,137,138,222 More recently, the modification of interferon alfa-2a via a branched-chain polyethylene glycol moiety has produced a compound, peginterferon alfa-2a, with prolonged absorption, slower clearance, and a longer half-life than standard interferon, with once-weekly dosing possible.223,224 Randomized trials have shown peginterferon to be superior to standard interferon, either alone or combined with ribavirin, for the treatment of chronic hepatitis C infection in adults.225,226,227 While the use of ribavirin is contraindicated during pregnancy,228 interferon has been used safely for the treatment of T-cell leukemias during pregnancy,229,230,231 and its potential role as an antiHCV therapy for both maternal and fetal/neonatal benefits warrants further exploration.